A richly rewarding spring of practical wisdom to help you focus on what's in your control, eliminate false and limiting beliefs, and take more effective action. Make The Daily Stoic your guide and you will grow in clarity, efectiveness, and serenity each day! This book was a delight. I started reading it earlier this year, caught up quickly (I started in July), and then mostly read a page each day when I was in the bathroom in the morning. I let it unfold slowly, reading the daily quote and Ryan Holiday’s (and Stephen Hanselman’s) thoughts on the quote, and then rereading the quote. About tranquility and stoicism and focusing on change, you need to read “The Daily Stoic” which is 365 essays, small essays about stoicism and why you should focus on things that don’t change. Where can you find joy? What's the true measure of success? How should we manage anger? Find meaning? Conquer grief? The answers to these questions and more lie at the heart of Stoic philosophy. The Daily Stoic is a compelling, accessible guide to living a good life, offering daily doses of this classic wisdom. Long the secret weapon of history's great figures, from emperors to artists and activists to fighter pilots, the principles of Stoicism have shone brightly through the centuries as a philosophy for doers. Tested in the laboratory of human experience over the last two thousand years, this timeless knowledge is essential to navigating the complexities of modern life. 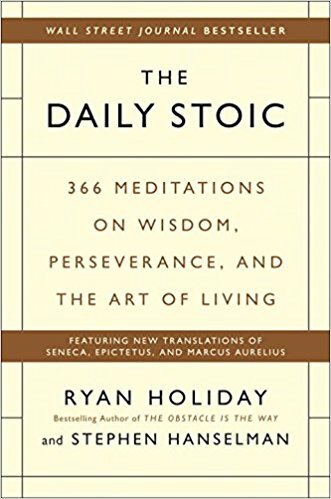 The Daily Stoic offers a daily devotional of Stoic insights and exercises, featuring all-new translations from the Emperor Marcus Aurelius, the playwright Seneca, and the slave-turned-philosopher Epictetus, as well as diamonds like Zeno, Cleanthes and Musonius Rufus. On each page, one for every day of the year, you'll find one of their pithy, powerful quotations, as well as historical anecdotes and provocative commentary to help you tackle any problem or approach any goal. By following these teachings over the course of a year (and, indeed, for years to come) you'll find the serenity, self-knowledge, and resilience you need to live well.